► But it is as good to drive? Once upon a time there was cooking and there was hot, with no middle ground between your everyday European performance saloon (or saloon-based coupe) and the full-house M, RS or AMG halo car. But nature abhors a vacuum, hence the proliferation of AMG 43s and Audi’s nicely judged S5. 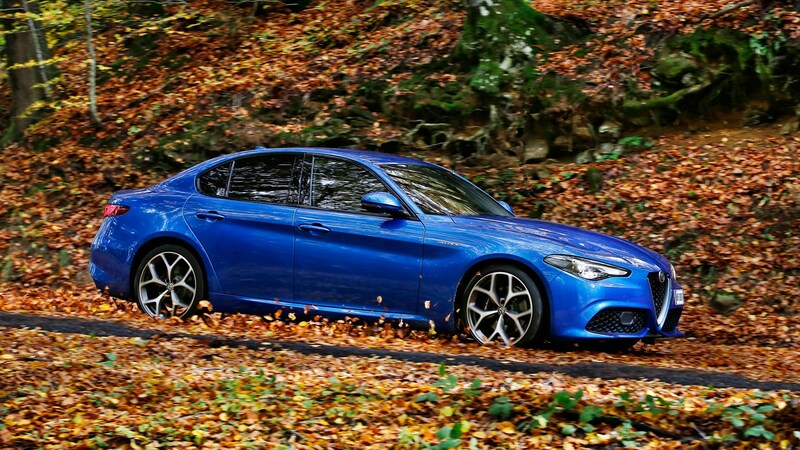 The Giulia Veloce is Alfa’s take on the same philosophy: the regular car made more purposeful and a little more expensive while leaving the range-topper, the Quadrifoglio, untroubled by cannibalisation. Veloce – that’s Italian for ‘fast’, right? Check you out, you well-travelled linguist. Yep, Veloce is the gorgeous-to-enunciate Italian word for fast, though in Alfa’s performance hierarchy ‘fast’ clearly isn’t as fast as ‘four leaves’ – the Veloce sits some way below the full-house Quadrifoglio. The Veloce’s not as fast, as overtly aggressive, quite as visually arresting – although to these eyes it is a very handsome car – nor anything like as expensive: UK Veloce pricing kicks off at £38,265. You’ll need another £23k to go shopping for a Quadrifoglio. Much of the obvious German competition uses six-cylinder engines but is also a good chunk more expensive. What are the key options? How do I make my Veloce as veloce as possible? 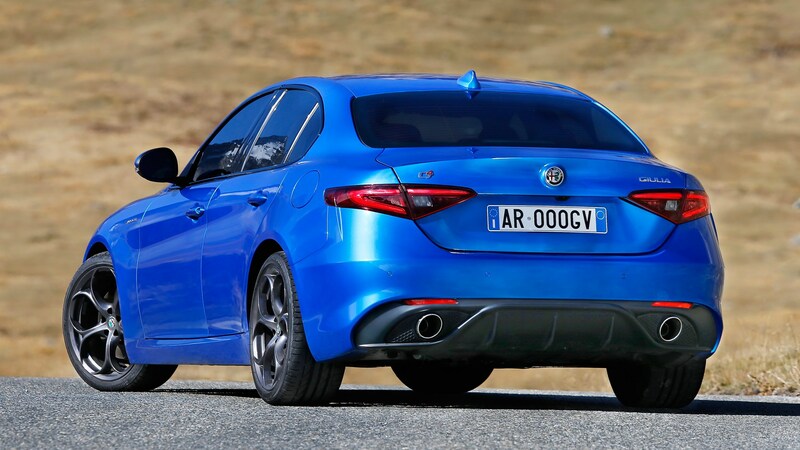 Whoever optioned our car crashed and burned on the aesthetics – Misano blue, a £695 metallic paint option, is too anonymously shy for an Alfa – but smashed the back of the net with the important stuff. Veloces run the Giulia’s uprated brake option as standard, while £1950 buys the Performance Pack: cool, deliciously tactile, column-mounted shift paddles for the eight-speed auto transmission (there is no manual), a limited-slip diff and Alfa’s adaptive dampers. Our car also boasted climate control (£250), the Convenience pack (£535; keyless entry mainly) and Harman Kardon audio (£950), bringing the damage to £43,240. So, is it wild or mild? A nicely judged alloy of the two. The Alfa’s four-cylinder engine does a fine job of impressing from the off, with a purposeful idle and meaty soundtrack as you get underway, its easy power and the nicely refined transmission effortlessly easing you up to speed if you drive lazy, with the ’box in auto and the drive mode set to Normal. The turbo four’s low-rev urge, even at pretty small throttle openings, is genuinely impressive, the strong torque shoving the car up to speed easily at next to no revs. You might still wish you had a six-cylinder engine in the nose from time to time, but the idea won’t haunt your every waking moment. The chassis too is a compelling blend of everyday civility spiced with the grip, poise and agility to match the storied badge on the nose. The steering’s fast and the body nicely controlled, making for a strong, agile front end that loves to run into corners fast and hard. Despite the engine’s decent thrust, rear-drive and LSD, the Veloce’s stock in trade is fast but neat, wheels-in-line cornering, the chassis’ balance and sensitivity to wheel and throttle more about nuance than lurid slides. Maybe in the wet it’d be livelier but don’t take the lack of spiky oversteer as a criticism – the Veloce’s control and dynamic polish is to be relished however hard you choose to push it. Equally impressive is the suspension pliancy, a quality that means the Veloce needn’t back off just because the tarmac’s a touch rough. The ride’s supple and composed even in the Veloce’s most committed drive mode. (For better or for worse, the Veloce lacks the Quadrifoglio’s full-house Race mode, with its hyperactive responses and complete lack of nannying electronics). And should the road get really rough, the Veloce still has its Ferrari-inspired ‘bumpy road mode’ up its sleeve – a godsend on some of the UK’s most mangled roads. That’s the good news. What’s the rub? Famously developed at breakneck speed by an FCA dream team in just a couple of years, the Giulia’s Giorgio platform nails the basics. In both Giulia and Stelvio guise, and regardless of engine, it’s a treat to drive; supple, responsive, communicative and balanced. But there are gripes. The Veloce’s rear seat accommodation is cramped, even by compact saloon class standards. And while the cabin scores highly on its fundamentals – nice driving position; the evocative hooded speedo and tacho; some quality touch points, including those optional alloy shift paddles – elsewhere a keen eye on both the budget and the clock manifests itself in the form of some sketchy plastics, a pretty basic infotainment screen (intuitive iDrive-style operation, though) and a couple of buttons and rotaries that’d have Audi’s interior designers wetting themselves. You noticed. The European hot-but-not-too-hot compact saloon/coupe buyer is spoiled for choice, with Audi offering the 349bhp S5 for £49k list, BMW the ageing but excellent 321bhp £45k 440i, and Mercedes the fine but different-league C43 AMG Coupe (nearly 400bhp; over £50k). The Alfa comfortably undercuts the lot, helping forgive its modest cylinder count, if not the feeling that you have to take the Veloce’s sparkling dynamics and undeniable style as compensation for a few areas of sub-par finish. Handsome, great to drive and sweetly pitched, both in terms of performance for the money and chassis aggression versus refinement, the Veloce is a compelling proposition. It’s not perfect but it’s quite possibly the affordable Alfa sports saloon you’ve been dreaming of.